The actual dates of the Battle of Britain have caused some discussion amongst historians, but for the purposes of Harold's story the official dates will be taken. To qualify for the 'Battle of Britain Bar' meant having served as an aircrew member in a stipulated squadron, and flying at least one operational sortie between 10th July and 31st October 1940. The Bar is worn on the 1939-45 Star ribbon. Enough has been written about the Battle to make it unnecessary to repeat it all, except where it has a direct bearing on the RAF career of F/Sgt H. Orchard. The Battle of Britain can be considered as progressing through four phases, but because 65 Squadron were posted to Scotland at the end of August, Harold was not directly involved in the last two. Immediately prior to its direct involvement in the Battle, 65 Squadron was honoured by being chosen as the unit which would be sponsored by the East India Fund. On 15th July a party including Captain Balfour, the Under Secretary of State for Air, and Mr.R.Hodge representing the East India Fund presented no fewer than eight Spitfires to the Squadron. Despite pouring rain, a fly-past was arranged for the visitors. The Squadron was in future to be known officially as 'No.65 (East India) Squadron', and the Operations Record says that the new name 'looks really wizard painted on the engine cowlings'. Later, the aircraft carried the name in a small rectangle just below the cockpit. One other modification is worth noting, although no doubt several other squadrons made a similar alteration, and that was the fitting of wide-angle rear view mirrors, thus increasing the possibility of seeing an enemy aircraft attacking from behind. After the defeat of France and the British Expeditionary Force, and the evacuation of Dunkirk, the Germans began to prepare for the possible invasion of Britain. In order to cover a Channel crossing, air superiority was vital, and so the Luftwaffe set out to destroy the RAF. The first steps consisted of sending bombers, escorted by fighters, to attack British shipping in the Channel, the purpose being ostensibly to draw Fighter Command up into combat against what the Germans hoped would be overwhelming odds. Being part of No.11 Group covering the South-East of England and area around London, 65 Squadron was heavily involved. 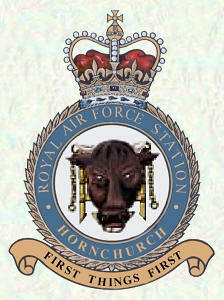 The Squadron's normal routine was to leave its home base at Hornchurch each morning for the 15-20 minute flight to Manston ('Charlie Three'), from where patrols were mounted during the day, returning to Hornchurch in the evening, or occasionally Rochford, and Harold's Log Book reflects this routine. From 10th July to the end of the month, 21 such days are recorded. On most days two or three patrols were flown, usually of about an hour's duration. The log book records show nothing outside this routine for July, except an entry on the 28th to the effect that 'A/c damaged on landing'. "As Red 3 of 65 Squadron, we were detailed to patrol a convoy off DOVER. We were at 19,000 feet when we sighted approximately 6 to 8 Me.109's between us and the French coast, at about 9,000 feet. "My section dived to attack them and I attacked one which was attempting to evade by diving; he turned and I overshot him, only getting a short burst (1 second) at him, from 300 to 250 yards range. "I had lost considerable height and now saw two others in front of me also diving towards the French coast, and I followed, getting in two 1 second bursts from 300 to 100 yards on the first one, when white smoke came from it. I overshot this one owing to initial speed but saw it lurching from side to side as it got nearer the water. "I then attacked the 3rd one but only got a short burst from about 350 yards at him before I lost him in a haze at about 100 feet above the water, one mile from the French Coast." At this stage in the War, the RAF were still flying in the pre-war 'Fighting Area Attacks' consisting of three aircraft in Vic formation, hence Harold's reference to being Red 3. Such tactics were soon to be altered in the light of battle experience to the much more flexible 'minimum pairs' with a leader, or 'No.1' being protected by his 'wing man' or 'No.2'. Two such pairs formed a 'finger four' each mutually protecting the other. The system of Channel patrols continued for another week or so until the Luftwaffe began to change its tactics. In this period 65 Squadron lost two more pilots when, on 8th August, Sgt. Pilots Kirton and Phillips were killed. Having failed to have a devastating effect on the RAF in the air, the Germans now attempted to paralyse it by attacking the airfields and destroying aircraft on the ground. At this time, as well as Jeffrey Quill, 65 Squadron counted amongst its number P/O Brendan 'Paddy' Finucane. Other pilots were two Polish refugees, Szulkowski and Gruska, P/O's Glaser, Olive, Nicholas, Wigg, Pyman, Hart, Smart and Gregory, and Sgt Pilots McPherson, Franklin, Kilmer and, of course, Orchard. The daily routine of flying to the forward airfield at Manston continued on most days. At Manston, the now familiar images of the Battle of Britain would have been seen. The pilots waited near, or in, the dispersal hut. At Manston this was a typical wooden airfield building. Aircraft were parked within easy running distance. From time to time the telephone would ring; usually it was Hornchurch giving advance warning of a raid which had been detected by the radar network. Once the order was given to 'scramble' the pilots grabbed their parachutes, fastening them as they ran for their planes. The ground crew would usually have the engines running, and were standing on the wing beside the cockpit, from where they helped the pilot plug in the R/T lead and connect the oxygen. The airman would then shut the shoulder-height cockpit door and jump to the ground while others unplugged the ground accumulators used to start the plane, and pulled away the wheel chocks. Within minutes of the order to scramble being given, the squadron was airborne and heading to the locations given by control. On 12th August Harold was piloting R6884, and his Log Book states simply 'Bombed on Take-off', but in fact the event was more dramatic than this, as Jeffrey Quill recounts in the much-quoted extract from his book "Spitfire - A Test Pilot's Story". He describes how the Squadron was on the grass airfield waiting the signal from Sqn.Ldr. Saunders to take off when the pilots became aware of a number of 'crumps' and saw a hangar explode. Realising that they were being dive-bombed by Me.110's, the pilots gave their Spitfires full throttle and took off as rapidly as possible, some attempting to engage the enemy which were, in fact, going much too fast to be caught. Miraculously eleven of the twelve planes took off safely, the exception being P/O Hart, whose propellor was spun backwards by a bomb blast and his engine stalled. Fortunately he escaped injury. Al Deere, in his book 'Nine Lives', says that before the incident Jeffrey Quill used to maintain that the 'young pilots' didn't know what a really fast scramble was, but afterwards he didn't mention it again. 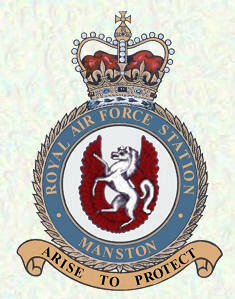 Manston Station's own Record says that the attack happened at 1250hrs, and involved about 15 ME110's and some Heinkels. About 150 bombs were dropped, leaving some 100 craters. Two hangars were damaged and a workshop destroyed. Unfortunately, a civilian clerk in the workshop was killed. The Squadron returned to Manston the next day to find all the bomb craters had been repaired by the Pioneer Corps, although some craters remained near the edge of the airfield, which were close to unexploded bombs. Manston was to be attacked six more times in the next two weeks, causing more casualties, and eventually leading to the decision to evacuate all but essential personnel. As the attacks increased, repairs were not made so quickly, often due to the presence of unexploded bombs, and on 29th August Churchill visited Manston and was horrified to find bomb craters caused four days previously had still not been repaired, prompting him to suggest to the Secretary of State for Air that a mobile team be set up deal with such repairs, and local contractors be asked to provide stock-piles of materials at each airfield. On 13th August the Squadron lost P/O Gregory, and on the 15th they were again on the ground at Manston when it was attacked, this time by nine ME110's with gun-fire as well as bombs. The enemy were engaged by the ground defences and two were brought down, one by the Royal Artillery gunpost and one by the RAF. Two hangars were wrecked and two others damaged, and a large crater left in the middle of the airfield. Other attacks on Manston were on 16th, 18th, 20th, 22nd and 24th August, and although 65 operated from the airfield on some of those days, they do not appear to have been involved in any of the action. "At 12.51 hours, 65 Squadron left Rochford to patrol Canterbury and then Manston. Yellow leader burst a tyre in the take-off and 'A' flight patrolled only 5 strong. "When at 4,000 feet a large force of enemy bombers was seen to the North proceeding South-East. This was reported to Control but they were too far to engage. Later, a force of about 40 enemy fighters was observed to the North-West at about 20,000 feet. It appeared possible that there might be an engagement going on with our own fighters, so the leader started to climb up in an Easterly direction to gain height. It was not considered justifiable to attack the bombers with only 5 aircraft. "When at about 10,000 feet a He.111 was observed beneath us proceeding alone in a South-West direction over Foulness. "The leader led the Flight down in line astern for a quarter attack - four aircraft of the Flight fired and the aircraft was last seen descending with smoke coming from out of the engine and during the engagement some pieces were seen to fall off the wings. "After this attack they climbed in accordance with instructions from Control, but the Flight became separated in clouds and in view of the large number of e/a in the vicinity the Flight attempted to reform over base. Then they observed a force of at least 60 bombers proceeding Westwards along the North side of the Estuary. Our fighters were below them and not in a position to deliver an attack, so they again climbed towards a fighter engagement going on higher up. This, however, became obscured by cloud and the Flight made no further contact with the enemy. 'B' Flight also sighted the enemy formation but could not get near enough to deliver an attack." The plane was, it is now known, piloted by Leutnant Rudolf Ahrens of 1st Gruppe of Bomber Geshwader 1, and he was separated from the rest of his unit because of engine trouble. Following the attack by 65 Squadron, he was again attacked, this time by Sqn.Ldr. Crossley of 32 Squadron, and eventually landed his plane near Snargate, on Romney Marsh. The wounded flight engineer unfortunately died later in Rye Memorial Hospital, the rest of the crew being taken prisoner. Mr. Vic Maxwell was a corporal in the Somerset Light Infantry based in the area at the time, and was often involved with capturing downed German aircrew. He recalls how many of them were not hardened 'Nazi types', and seemed glad that for them the war was over. On the same day as the above action P/O Gruska failed to return from a patrol and it was thought that he must have crashed into the sea. However, in 1975 his Spitfire was found in Kent with his body still in the cockpit, and he was buried with full military honours at Northwood cemetary. Both Jeffrey Quill and David Glaser attended the funeral. 65 Squadron continued to be at the forefront of the action, and on 22nd August a patrol was sent up to intercept raiders over the Channel in the early evening. A large force of enemy aircraft were encountered and engaged, and the Squadron claimed 1 ME109 destroyed, 1 probably detroyed and 1 damaged. Unfortunately, Sgt. Pilot Keymer was killed, and Harold's aircraft was damaged, it is believed by Fw. Philipp of II Jagdgeshwader 26, in a Me109. Harold landed Spitfire L1094 back at Manston unhurt, and the aircraft was quickly repaired, Harold returning to Hornchurch in it on the following day. The routine continued for a few more days until, on 27th August, 65 Squadron, which had been in the front line of the fighting for nearly two months, was ordered to rest and refit in Scotland, and so flew to Turnhouse, landing at Church Fenton en route to refuel.